Troy Iwata, Ray Santos, Shirley Huang, and Ariel Estrada in Joker. Photo by Shirin Tinati. BOTTOM LINE: A completely captivating examination of choice, love, and loss through the lens of the marriage equality movement. 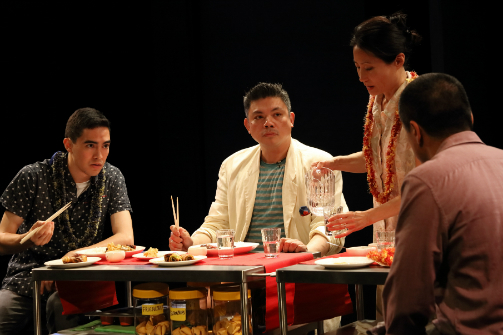 Joe (Ariel Estrada), his wife (Shirley Huang) and stepson (Troy Iwata) seem like a typical dysfunctional family; humor blends with a bitter domestic weariness as their failing restaurant and crumbling marriage becomes exposed. Mother and father fight, while son, the typical teenager, falls in love with a girl at school. The actors truly breathe truth into their characters and believe each word they say, drawing audiences in even while they do mundane tasks such as cleaning, setting tables, or making fortune cookies. When Joe’s old friend Frank (Ray Santos) comes to dinner, this sense of normalcy turns on its head. Santos’ creation of an over-the-top character makes Frank a standout from his first entrance, and as tensions between Joe and Frank inexplicably grow audiences wait with baited breath for the next word from either man to see who will be the first to explode. Frank brings with him the idea to make Joe’s restaurant “gay friendly,” creating comic distraction from his ulterior motives, returning Joe to the person he used to be. Behind all of this sits the Hawaiian fight for marriage equality, paralleling the internal struggles the characters face regarding relationships and sexuality. The audience slowly gains more insight into the characters' romantic past and sexuality as the fight for marriage equality heightens, personalizing the fight even for those audience members who may not be directly involved. As the plot twists, and new details rapidly become revealed, the show picks up steam. Well constructed by playwright Yilong Liu, the naturalistic dialogue and acting style puts the audience almost in the mind of one of the characters, allowing them to experience the emotions of those felt onstage, internalizing the plot rather than analyzing. For anyone who has ever so much as had a crush, this show is a must.